You don’t need more floss to keep your smile healthy. In fact, your local dentist in Eagan suggests you only floss when you brush your teeth. Oral hygiene can be time-consuming. The toothbrush, toothpaste, floss, and mouthwash add up in cost over the year. What’s more, you’re supposed to visit your dentist in Eagan at least twice a year for a cleaning and exam. So how do you keep your mouth healthy without breaking the bank in oral hygiene products and dental visits? Well, in this article, Denmark Dental is going to share some time-tested oral hygiene routines you can integrate into your daily life to keep a healthy, beautiful smile. A common “hack” is to stack new habits onto old habits. For example, if you watch 30 minutes of YouTube or scroll through Facebook before bed, you can stack brushing your teeth before that activity to ensure it happens. For some, brushing their teeth before bed is an afterthought the next morning — or the next week. It’s important you create a routine to keep up with your oral health. A common misconception is that if you brush two or three times a day you will not need to floss your teeth. The average person has a hard time remembering to brush their teeth even once a day. Nonetheless, you want to stack the habit of brushing with flossing, too. If you think flossing two or three times a day is excessive, floss only once — and floss before bed. As you finish up brushing your teeth, shift the bristles of your brush to your tongue. Yes, your tongue can harbor bacteria and cause bad breath. What’s more, a clean tongue contributes to clean oral health. For some, mouthwash is must-have in their oral routines. For others, mouthwash is something they swish around before a first or second date. Decide how you want to use mouthwash and stack it with your other oral health habits. After you eat a meal, drink at least eight ounces of water. Not only will the water help keep you hydrated, but it will also help wash away the negative effects of acidic or sticky food. Drinking water throughout the day helps your teeth remain healthy, too. You will find a variety of advice online about when and how you should eat prior to bed. 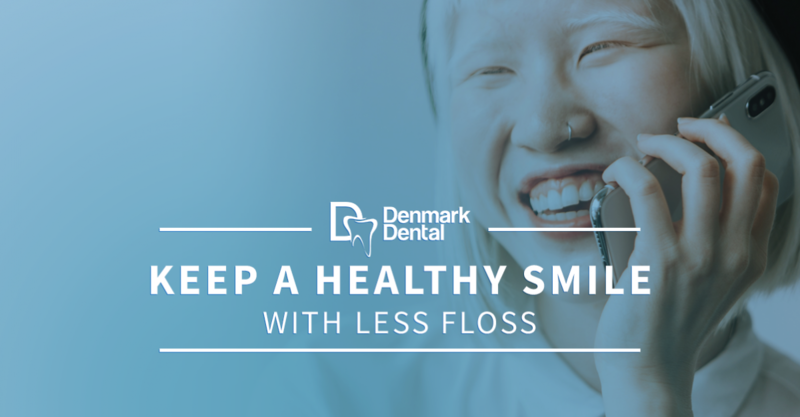 At Denmark Dental, we believe that you can help improve your oral health by eating less sugary foods and drinking less acidic beverages. Some of your common culprits? Soda, candy, yogurt, juice, granola, coffee, and protein bars. Some foods and drinks are sold as “healthy” but check the nutritional information to see the truth about sugar content. A dental visit takes more of your time than actually being at the dentist. You have to set the appointment, drive to the office, have your appointment, drive home (or back to work), and then shuffle around the items you displaced due to the dental visit. We get it. However, your oral health relies on examination from an expert to catch diseases and conditions otherwise unseen or unknown by you. If you want to keep a healthier smile, you can do it with less floss. In fact, if you pair your flossing with your brushing, you will use less floss, since, you’re brushing away a majority of what’s in your mouth. Remember, you want to visit your dentist at least twice a year bare minimum. You may have great oral health, or you may have existing conditions that need regular attention. How will you know if you do not visit a professional like your dentist in Eagan. Give our dental office a call and schedule your appointment today!